Withersfield sits not far from the busy town of Haverhill in that little peninisula of Suffolk jutting out into Cambridgeshire and Essex. The pretty name of the village comes from the ancient practice of enclosing a large area for wether sheep (that is to say, castrated males kept for their wool) to roam fairly freely during the summer months. The prefix occurs three times in Suffolk village names, here, again at Withersdale in the far north, and also at Withermarsh in the south east. In all three cases, it is open ground near to a larger settlement. 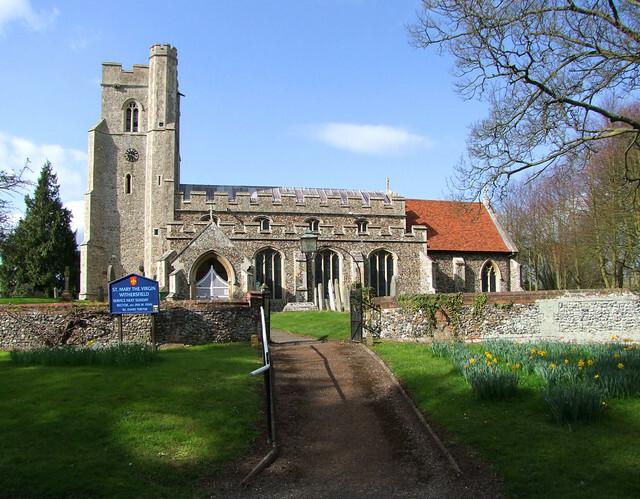 St Mary is set in the heart of the village near to an ancient crossroads. The church begins a theme that will be common as you move east of here, for the stair turret rises above the battlements of the 15th century tower, which, with the dedication, will become a motif of the Stour valley. 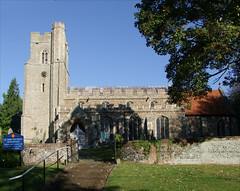 Seen from the road, the south side arrangement of battlements, clerestory and aisle appears the very model of Suffolk perpendicular. In fact, this is an illusion, for just about everything you see is Victorian, only the clerestory being medieval. Even the chancel was rebuilt at this time. The oldest survival in the entire building, however, can be seen without even going inside. 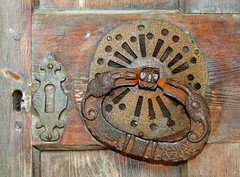 The door handle, with its two Harry Potterish dragons, survives from the 13th century church. 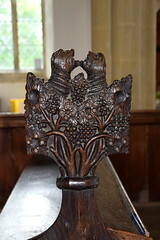 St Mary is most famous for its bench ends. 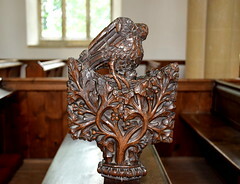 They line the north ends of the south nave benches. 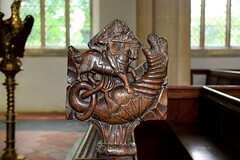 The most easterly is the image of St George defeating the dragon, the serpent writhing in agony beneath the knight's horse's hooves. 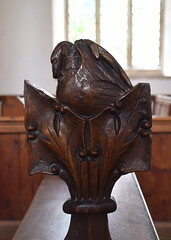 Among those to the west of it are a perky little mermaid, a pelican in her piety, a swan wearing a collar and two bears fighting amongs foliage. 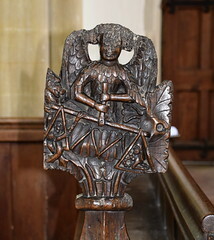 At the far west is St Michael weighing souls. 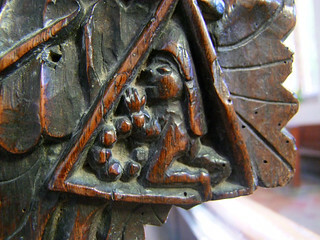 A man kneels in the right hand bucket of the balance, and his sins are measured against him in the left hand balance in the form of a malevolent little creature. Although this image is familiar from medieval dooms, it is particularly interesting here. On the extreme left, the devil has appeared on the scene, and is holding the evil side up before letting it drop. Only the power of prayer will get the just man out of this, and so he clings tightly to his rosary beads. I wonder if post-Reformation Withersfielders took the image to mean that such Catholic ritualist practices as praying with a rosary would be bound to land a man in hell. Pippa Blackall's characteristically lovely window of St Cecilia sits in the north aisle east window. 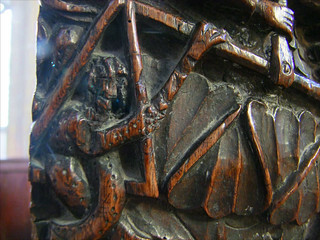 Beside it, guarding the entrance to the Victorian chancel is one of the best 15th century rood screens in the area. The doors, a feature of this area, are similar to those at Cowlinge. Mythical and heraldic creatures haunt the spandrels, but there are no saints below for the screen was repainted in the rather gaudy fashion of the 18th century, at which time it was adorned with cherub heads and foliage. This ought to be awful, but somehow it works, although of course you wouldn't want it everywhere. Interestingly, this restoration of the screen might suggest that the chancel was in use for worship in the 18th century. Another mystery is up in the roof of the nave. 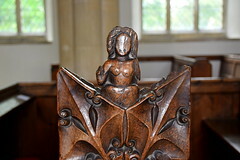 This was entirely reconstructed in the 1980s, but the hammerbeams survive from the medieval roof, and appear to be unfinished; a couple have figures on, but one has an unfinished figure, while another has curious markings and what may be the fixing for an angel. There is nothing mysterious about the north aisle roof for this is a mellow, beautiful piece, with curious bosses including a man's face which is deliberately aslant, and an eagle. 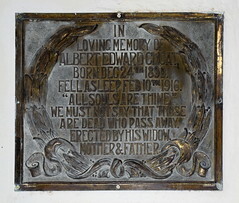 It dates from just after 1480, and the brass at the extreme east is for the donor, Robert Wyburgh. The elegant tower arch rises above the font, and Miss Heylen's plaque claiming the front bench for Hanchet Hall in 1810. The typically rustic parish charity board is charming, not least because the parish name appears to have been painted out at some point, probably during the Second World War. Also, there is a great curiosity behind the south door. It appears to be an arcade capital turned into a holy water stoup. It must be earlier from the south arcade, removed when the aisle was rebuilt. Yet another sign that the Victorians' great enthusiasm for this place was all done rather well.